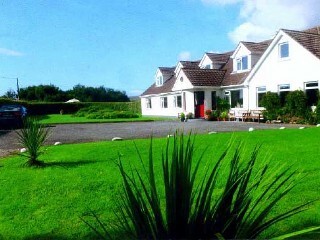 Faul House in Clifden, County Galway, is part of a 40 acre farm home to many animals. The hosts, Kathleen and Michael, welcome guests to their home set in a peaceful location surrounded by breathtaking scenery. All bedrooms are spacious, bright and comfortable. A guest lounge is available for use where guests can relax in front of a peat fire. Breakfast is served each morning in a spacious dining room, overlooking the sea. Michael is more than delighted to have guests accompany him each morning as he tends to his animals when guests will have the opportunity to collect eggs for breakfast.